The boars now regularly wander along the road that leads to Walsh's apartment complex, in a favorite spot next to a nearby footpath and hang out in the local playground. "They're super tame and friendly," says Walsh, but adds that she always keeps a watchful eye on them when she has her twins in tow. 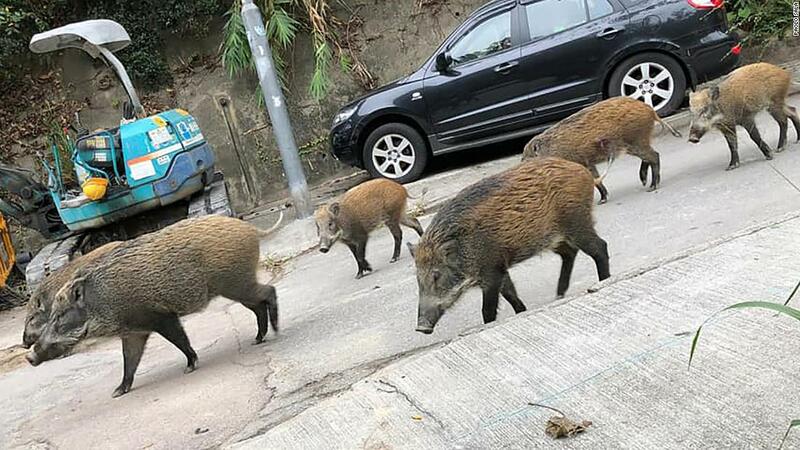 The number of boar sightings and nuisance reports has more than doubled in the past five years, according to the Agriculture, Fisheries and Conservation Department (AFCD). The beasts, which can weigh up to 200 kilograms (440 pounds ) and can reach up to 2 meters (6.5 feet) in length, have recently run amok in Hong Kong's financial district, roamed among airplanes at Hong Kong International Airport and wreaked a havoc in a shopping mall. Hong Kong is renowned for its dense urban areas and dazzling skyscrapers. Almost all of the development on Hong Kong Island is squeezed into a narrow strip of usable land around its perimeter. For residents here, it is only a short step from the concrete jungle to the subtropical rainforest that flourishes on the steep, rocky hills of the interior. In the 20th century, tigers still prowled parts of Hong Kong, but since they died out, the largest wild animal found here is the boar – and native wild pig. What is clear is that the boars – who were once solitary and secretive – are starting to lose their fear of people. 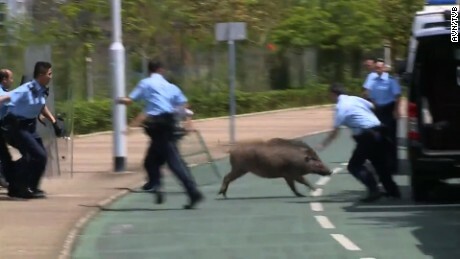 When she started running in Hong Kong, in 2012, she rarely encountered boars. If she did, they would retreat but now, "even if I clap and shout, they just keep coming to me and I'm the one to turn and run in the opposite direction," she says. "My fear is clearly greater than theirs." There have been only 10 recorded cases of wild boars injuring people since 2014, according to AFCD – but half of those incidents occurred last year. Boars have sharp teeth, and large males are equipped with vicious tusks. The animals, however, are "not generally aggressive," says Howard Wong, director of the City University of Hong Kong's veterinary school. "But like most wild animals if you corner them, they will react," he adds. "And you definitely want to avoid a mother with piglets." If a wild boar feels threatened, it will charge, says Wong, using his head "like a battering ram." Garbage bins are a lure. The boars are toppling them in search of food, leaving rubbish strewn over pavements. But the main reason for urban invasion, says Wong, is that "well-meaning individuals are feeding them." 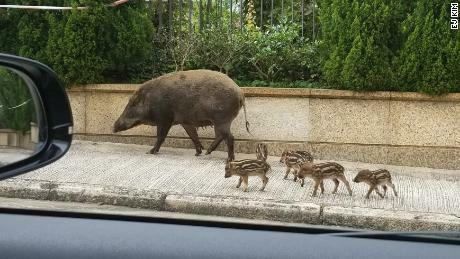 Veronique Che, an advocate of the Hong Kong Wild Boar Concern Group, believes that another factor is urban expansion. 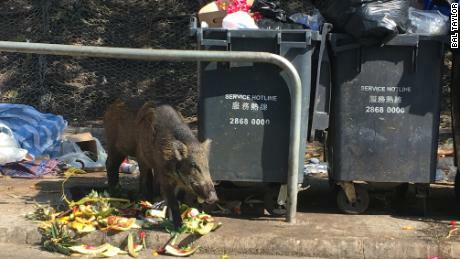 In the 1960s and '70s, the development of cities in the New Territories – the northernmost region of Hong Kong – led to the boars' natural habitat being built over and converted to farmland, says Che. 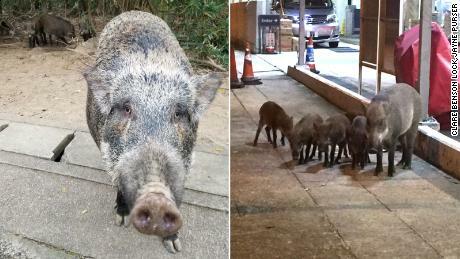 "Boars, along with Hong Kong's other wild animals, were squeezed out." One lawmaker suggested releasing natural predators into the wild but, as AFCD points out, anything big enough to kill a wild boar – such as a lion or tiger – would threaten humans. Culling has also been discussed. Two civilian hunting teams were previously authorized to shoot wild boars but were stopped in 2017 due to concerns about animal welfare and public safety. Instead, AFCD has launched a pilot program to capture "nuisance-causing wild pigs" and relocate them to remote areas. The boars are micro-chipped and some receive a collar equipped with a GPS tracker. Mature females have been injected with a contraceptive that is effective for about five years, and the feasibility of surgical sterilization is also being explored. As the Chinese Year of the Pig begins this week, Hong Kong is hoping that its pigs will not become an unmanageable problem in the 12 months ahead.